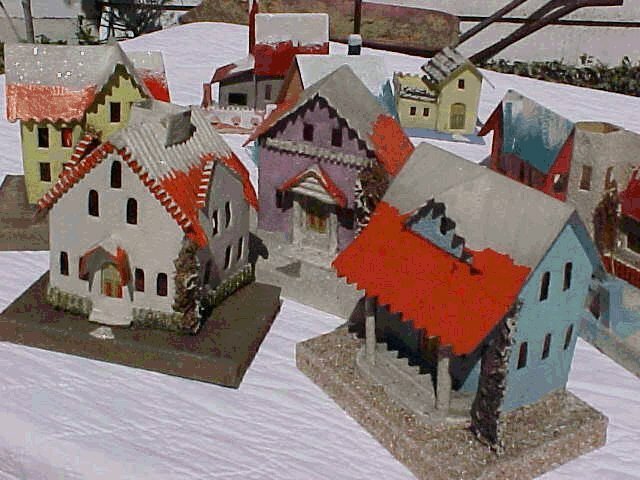 Christmas Village Houses and train layouts of the 1920s. 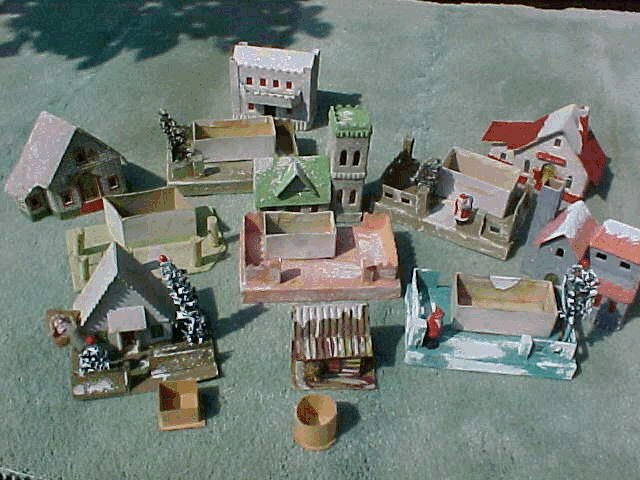 I was amazed to discover that the cardboard village houses do NOT go back to Victorian times as I had oft been told. 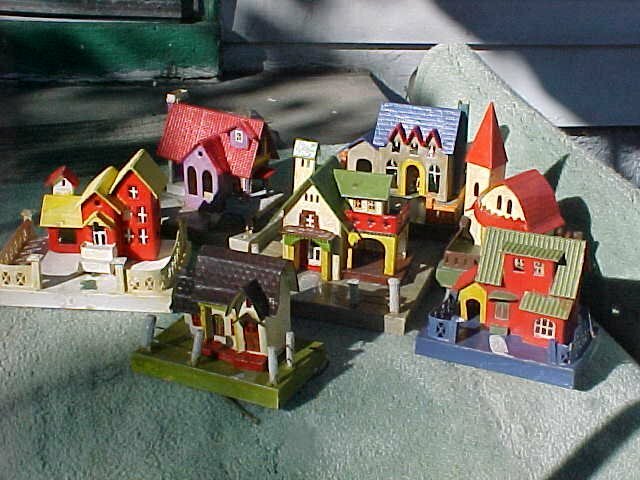 I have yet to discover any catalogued reference to what we usually think of as these little houses prior to 1928. At this point of research that seems to be it: 1928. 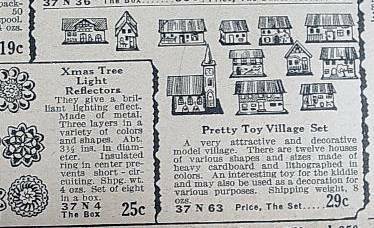 I am doing my level best to push the date of the illuminated cardboard "Made-in-Japan" Christmas houses prior to 1928, but so far no luck. 1928 stands for now. I can't beat it. Believe me, I've tried! - and I am working on it daily! 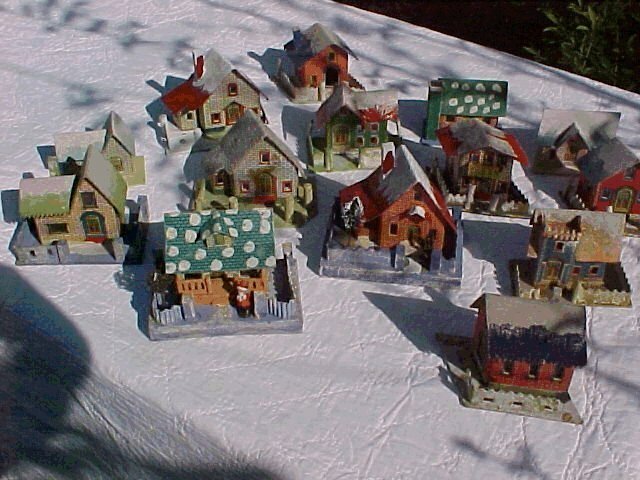 These are not the illuminated Christmas Village houses of investigation,here - but they are their direct ancestors. 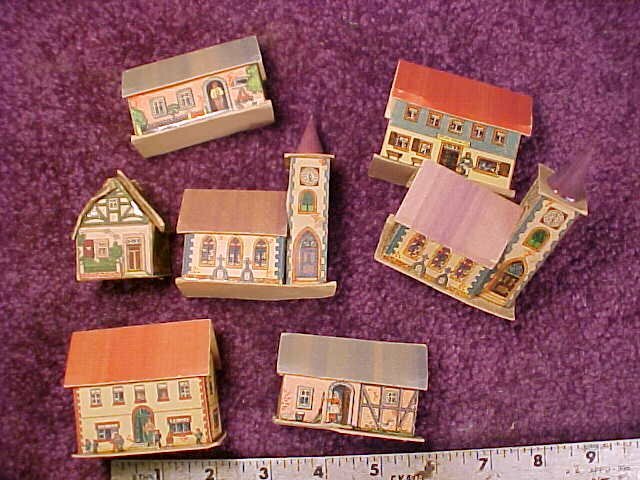 Little fancy boxes shaped like houses that came off their bases to reveal candies and small presents had been around since the turn of the 20th Century. Then ,inexpensive tree lights and electric trains came to the masses and these bloomed into a whole new category. 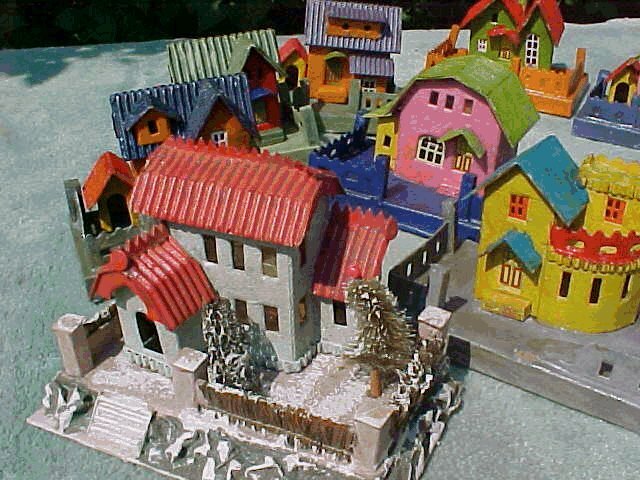 The "candy/surprize" boxes were a form of small gift-wrapping delight enhancement, then, which evolved into the electrically illuminated villages so many of us came to know and adore. 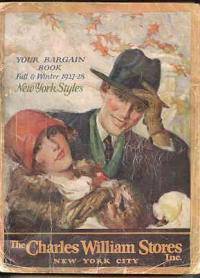 The Charles Williams Catalog of 1927: - a firm with centers also in Pennsylvania and Arizona! 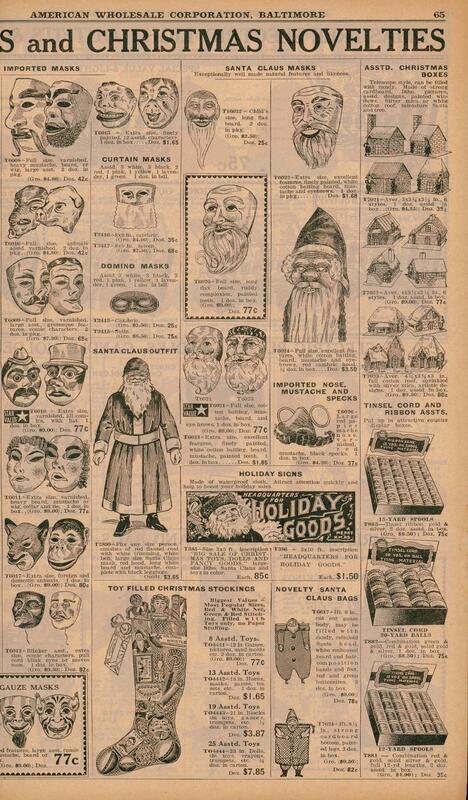 These "wholesale-to-the-public" mail-order catalogs were a ubiquitous fact of life in those days. 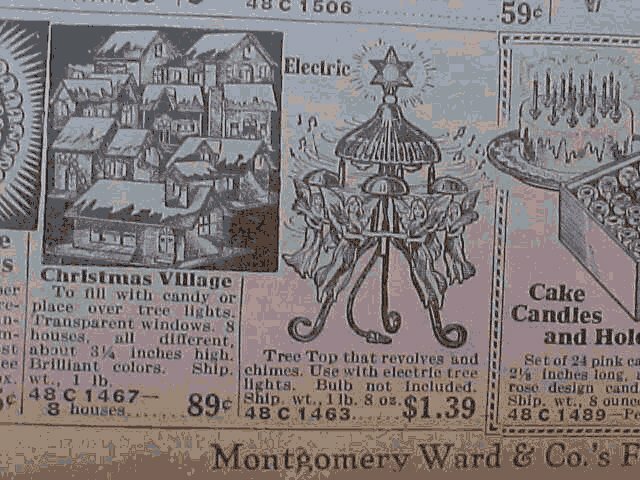 I spent a day some time ago examining microfiched portions of Sears catalogs from 1909 to 1929 at the big Carnegie Library in Pittsburgh : the Toy and Holiday Trimmings sections. 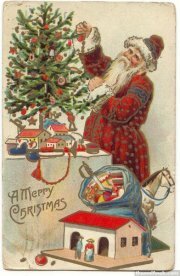 (Sears and Wards didn't begin having a separate Christmas "Wish Book" until 1932.) Around about 1927, they evolved quickly out of the imported "candy box" surprise containers -which do go back that far - during the 1920s. I believe they arose as a conjunction and accessory to the common series string of C-6 tree lights which became affordable and into widespread popular use during this exact same time period. Indeed, the fact they were so often sold in sets of 8 exactly coincides with the 8-lights-on-a-string series sets which remained the norm and mainstay of Christmas lighting until the early '60s when the subminiature "fairy lights" of today appeared and quickly took favor. 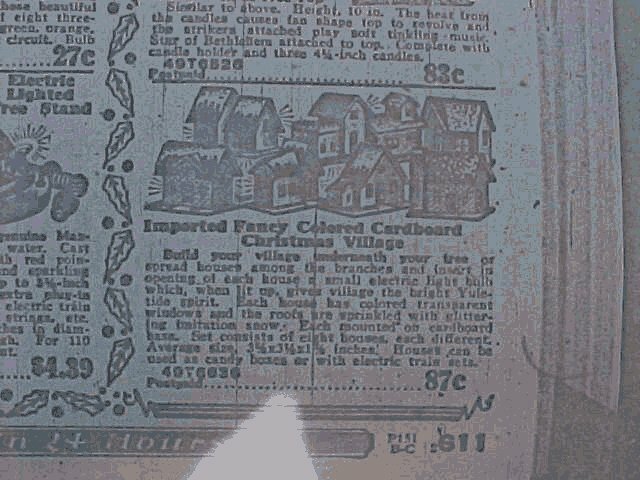 Though they were probably sold in dime and department stores by the mid '20s - village houses do not appear in the Sears and Roebuck catalog until 1929! Montgomery Ward - 1928!. In the pages shown, these are small, flat-card based 3 1/2" X 1 3/4" sets of 8 - not very fancy or elaborate - probably playing "catch-up" to something already growing popular. The Ward's seem somewhat fancier, showing more complex detail, but it's hard to tell from these engravings. 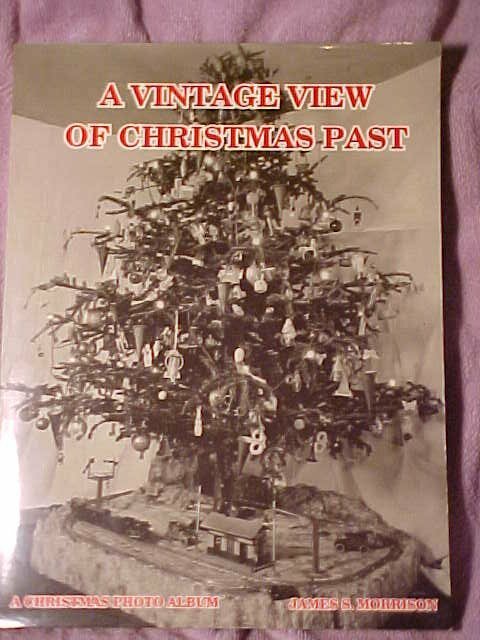 Actual photography does not come to these catalogs until 1934. Half the fun was trying to guess what a thing would actually look like when you got it! But Japanese or American, sets of 8 were the rule after 1928. 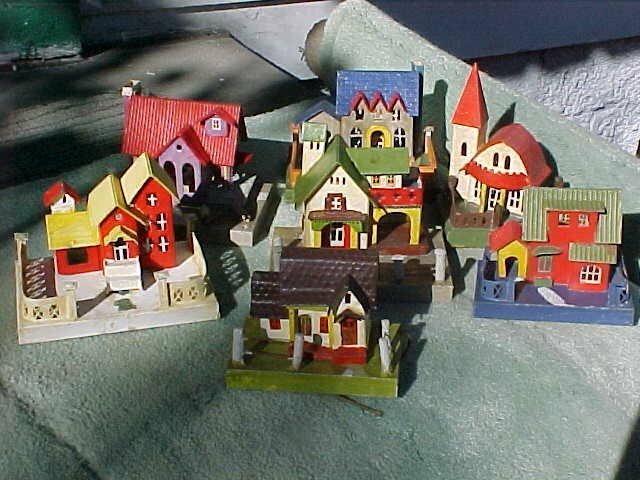 The little houses became the sisters of the lights. A pristine boxed set I believe to be the exact one represented in the Sears/Roebuck ad above. 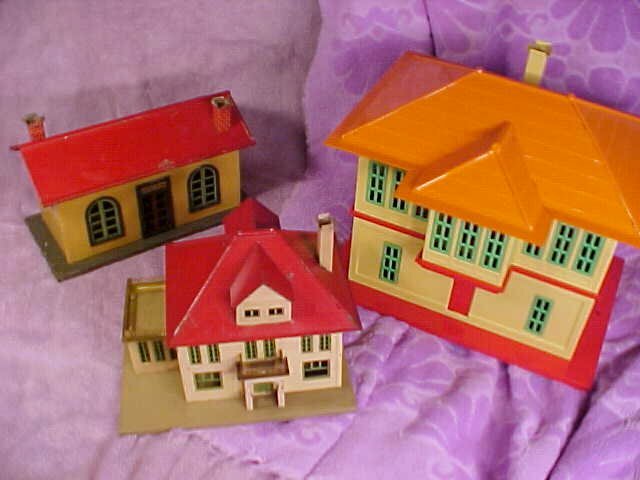 Both seem simply painted in the engraving, but the actual set reveals "Printie" sides on some and "Gloss-Top"(shellacked) roofs -especially the style of the roof snow - compare to the photos under Gloss-Tops below. 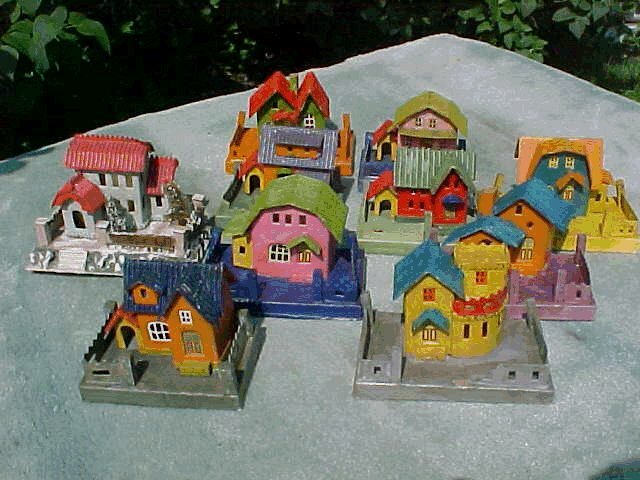 The smaller houses shown are obviously orphans from one of these sets. .... What a "Time-Machine!" - I HIGHLY recommend!!! 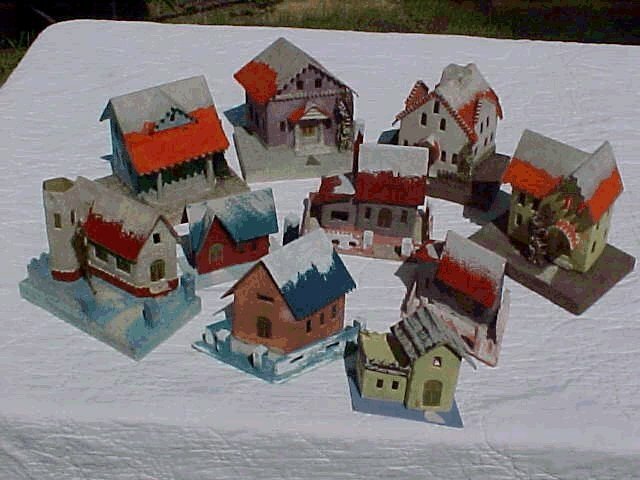 - So, - I have yet to find solid documentary evidence of the Japanese cardboard village houses prior to 1928! 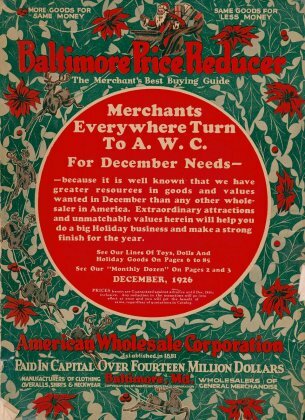 I am constantly in search of ads from mailorder catalogs, wholesalers catalogs, dated old home photos, and the like. If anyone has such evidence, please come forth!You needn't part with your treasured collectibles - just e-mail me a .jpg photo. I'm dying to see it and revise the above remarks accordingly! PRINTIES are characterized by lithographed brick sides or plain colors with lithographed stone masonry around the doors and windows. 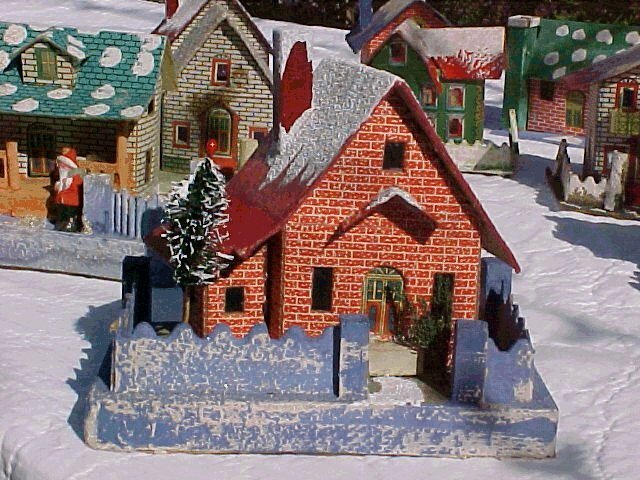 The roofs are glossy with hand-painted snow and glitter effects. Fence posts are always wood, round, half-round or square.Sometimes iron wire is strung between. Bases can be either flat or box. 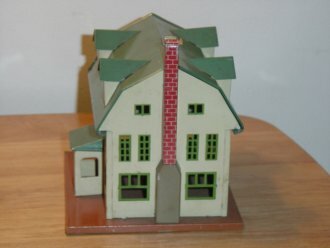 Many times the same style house can be found as a candy or "surprise" box,too. Note the odd "spots" on some of the roofs. That is strongly characteristic of this period. 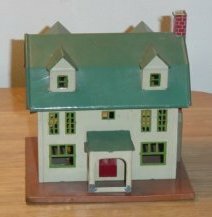 I know this to be 1928 because my Grandmother had this house.She penciled "1928"on the bottom when she bought it in Brownsville,PA that year. Matching hole plugs are another characteristic of the PRINTIE. This extravagance was not continued very long. They were no longer supplied during the coming styles of the '30s or again thereafter.Sometimes they're still there when you find a PRINTIE. If not, then it's been lost because they ALWAYS had them. Even the smallest ones. The G.T. 's are first cousins to the PRINTIES and coexist within nearly the same period of time, perhaps two years later. 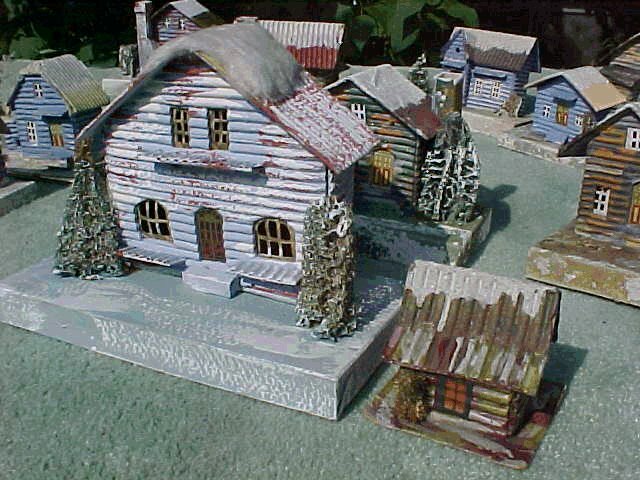 They are characterized by -you guessed it - glossy roofs - shellacked - with the snow handpainted over. Generally - shiny roofs are of the early period and last only into the early '30's: soon to be replaced with the "coconut," or shredded cellophane floss with painted and glittered "snow." The large G.T.s can be very squarish and blocky of body, but also you find such interesting types during this brief ca. 1930-31 period that are never found again later. (It's my personal favorite period.) Oddly, the big ones seldom have fences, while the smaller card-based often do. Almost no yard detail. The finish of the bodies is flat and almost lacking in texture except for a very fine sand. 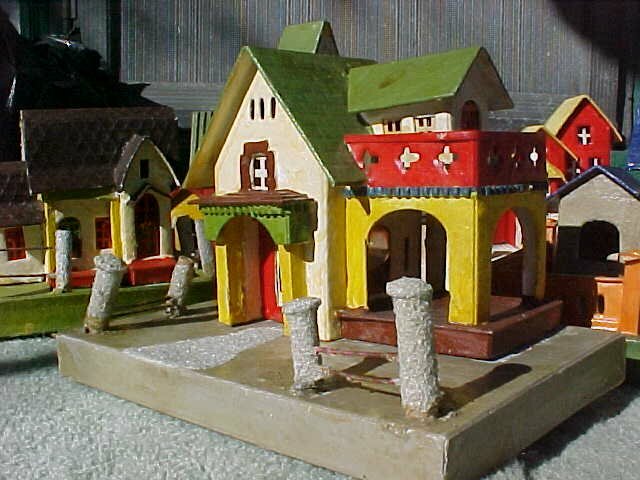 The bases, too - except note the pillared-porch example in the foreground: an early use of the "coconut"floss... this one made up of a mix of colors over white. I guess the candy boxes should fit in about here. 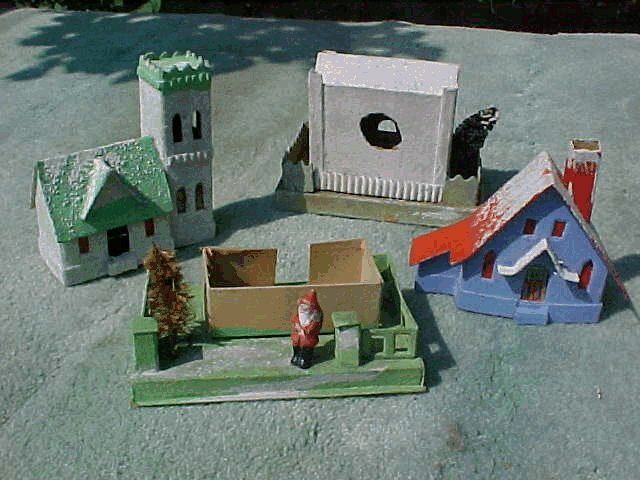 Candy/surprise boxes go further back than houses, taking the shapes of Santas, boots, snowmen and all kinds of things - including chimneys, houses and castles. This type is actually second period. These are different - a new breed of "candy-box." The old ones had no bases, no fences or yards. Many of these new styles can also be found as regular houses with light holes in the back and in other finishes...even "coconut." They are "SECOND PERIOD," from about 1930-34. Note there is a PRINTIE here - and a GLOSS TOP. Some are all sand.Still early, though, because all fenceposts are wood. The two little guys in from have "secret" compartments scarcely an inch across - just big enough to hold one bon-bon or the Hope Diamond. Your choice, I guess. Because they come apart in two pieces, you very often find just the top or just the bottom. Note the ragged hole in the back of the house rear-center. Candy boxes are often mutilated in this way. I think people grabbed them in the rush of shopping, thinking they were the light-up kind, got them home and then cut these jagged holes to make them be that way. (Actually shelLACKed,) - the classification nickname of "LAKKIE" can be a bit misleading. The first time I saw one of these "LAKKIES" it made me mad! I thought some goon had painted over or shellacked a fine old house. Not so! I began to come across more. There are 9 different shown here, plus one SUPER-LAKKIE, but I am sure there are more. I have to place them beginning in the late EARLY PERIOD - possibly 1928-32 -along with "GLOSS-TOPS" because of the styles and colors and all-wood fence posts. 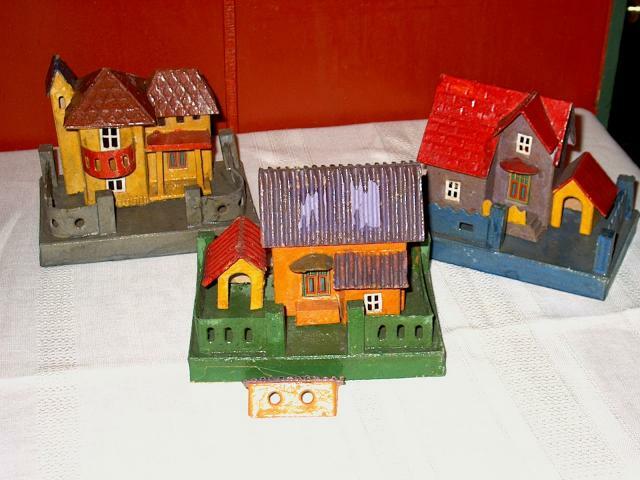 You'll find the exact same houses in other finishes... later COCONUTS and mixed textures. I briefly thought the factory ran out of the cellophane flocking and let them go out the door anyway, because you do not come across them as often as the others. They have an almost edible quality, as if made from brightly colored hard taffy. This set belonged to a family named Bair. 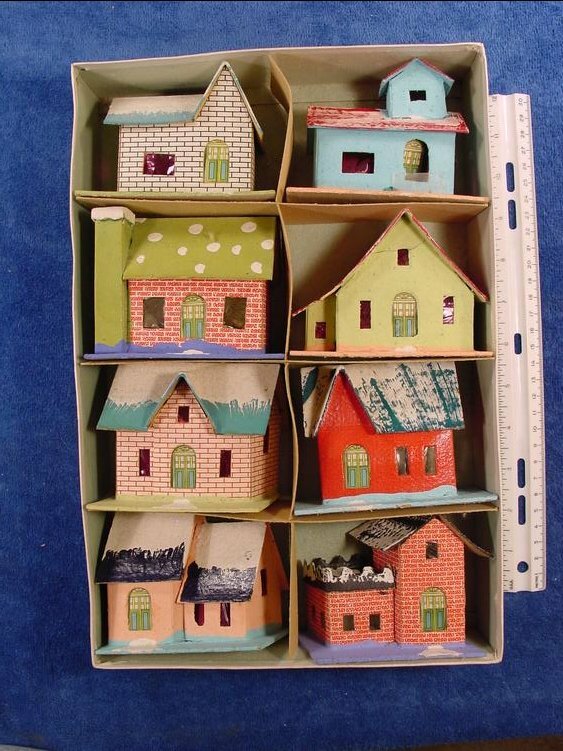 They are without doubt the among most elaborately detailed and extraordinarily structured cardboard houses ever made, and these are the only I have ever seen. They are definely LAKKIES: - glossy all over, except for the sandy rounded fence posts on some of them. 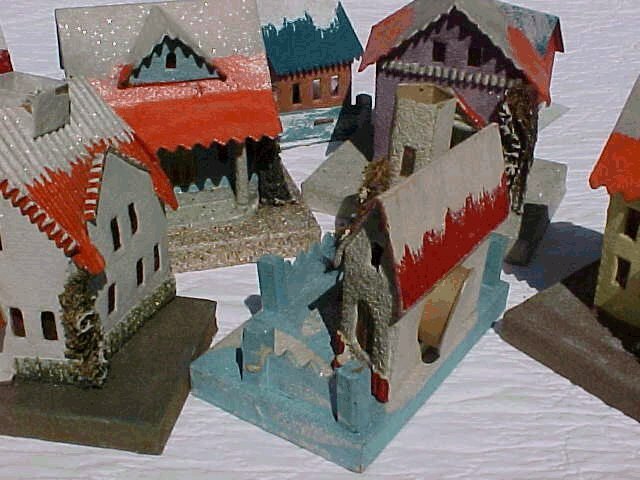 ANOTHER VIEW: The three smaller pieces are about the same size and very much like the LAKKIES above, but upon close inspection, all kinds of textural embossing of the cardboard - especially on the roofs -and other details set them apart. 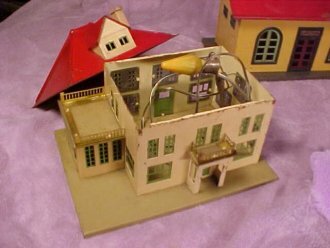 Three more "super-lakkies" which recently appeared on an eBay auction, listed as "Japanese Paper Train Houses, ca. 1930." .....all of which brings a hanging question to the fore ...I thought long and hard about the "lakkies." No snow. No snowy trees. (No trees at all!) No Santa figures. Snowmen. Nothing to connect with Christmas. Then I had an epiphany that these were most likely marketed to tinplate train enthusiasts, perhaps all year round. It makes sense. 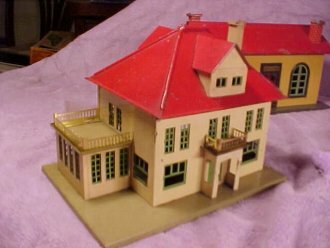 If one looks at the catalogued train buildings and accessories of the period, they were stamped sheet-metal and most were enameled or lithographed glossy! When new, these shellacked pieces would have been all but indistiguishable in finish - and nearly in style - from the VERY expensive enameled sheet-metal building train accessories of the period. 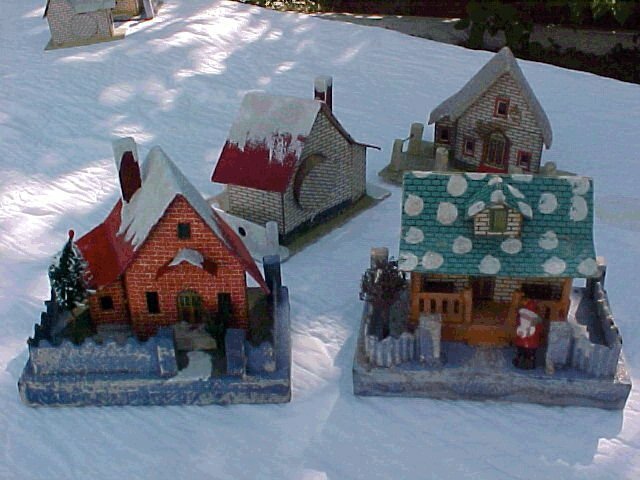 Though we see many of the same buildings in "coco," stucco, and combinations thereof - covered with snow, trees and figures - I believe there is a solid case that "lakkies" were not mainly about Christmas; they were about trains. Many Christmas train set-ups have green-grass bases depicting summer even nowadays. Many layouts were kept up all year round. 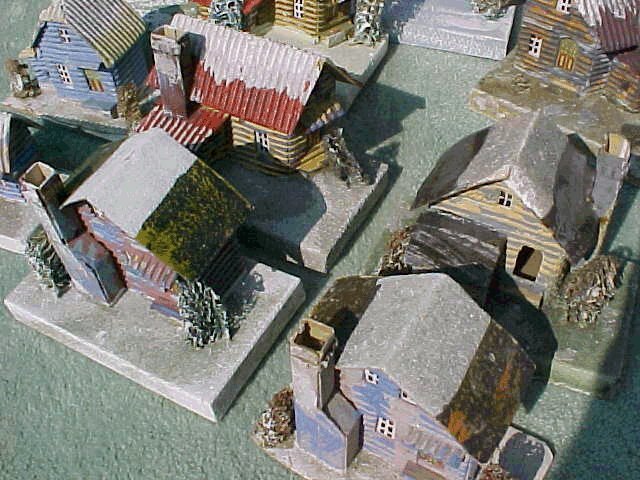 Dimestore cardboard houses would have been a cheap way to fill up scenic voids in layouts, green or snowy. I think it's possible they may have sold the LAKKIES in the train shops all year round. Note the way the window framing is reflected by the paper framing of the "LAKKIES." The connection, here, is plain to see. The "LAKKIES" were about toy trains. You could buy a couple dozen big "LAKKIES" for the price of one Lionel #191 Villa. 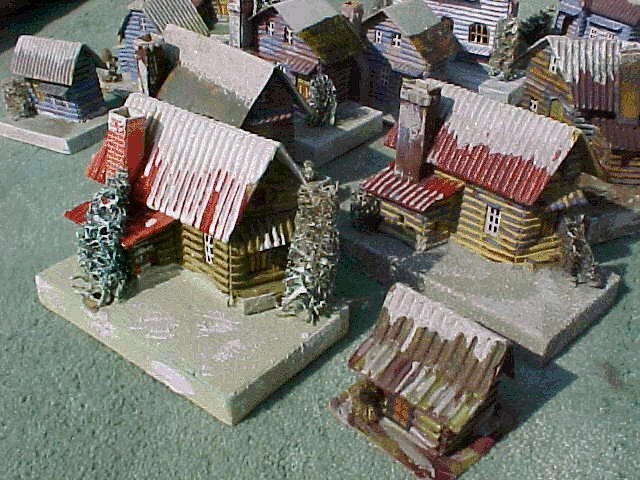 Some "LOGGIES" are actually a variety of GLOSS TOP, having the shiny roofs in the beginning -the rural first cousins of the PRINTIES and G.T.'s. 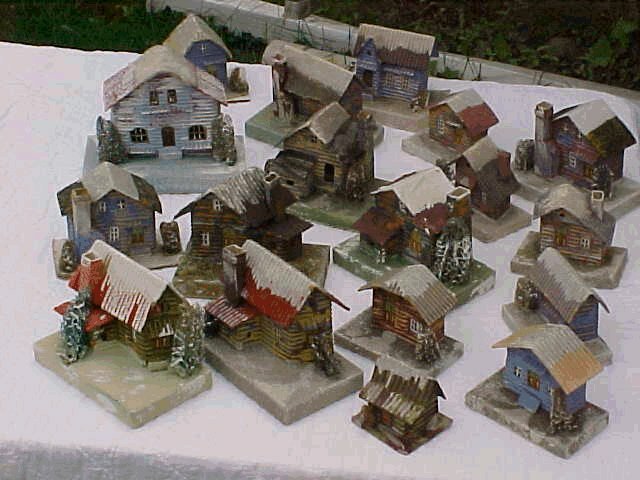 Some form of log cabin is found from the beginning right through to the bitter end in the early '60s when our Christmas stuff began coming from Taiwan - the single-faced corrugated carboard being a "natural" for the basis of the style. Note the chimneys on these otherwise identical LOGGIES" - one is actually a "PRINTIE" - pretty much tying them to the '29-32 period.. Both of these have glossy sides and rich colors. The little guy with stick-on window in the lower right is actually a candy-box, which you have seen before. There aren't that many different styles of Loggies but they came in different finshing schemes and a wide range of sizes. 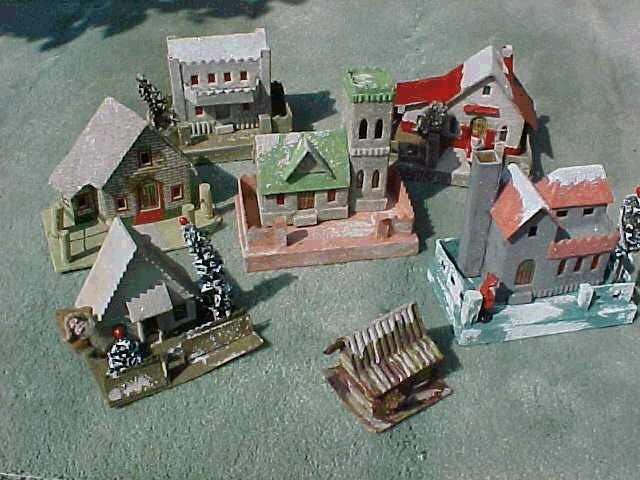 Many sets included 1 LOGGIE in with 7 others of the "in town"style. Above is shown a large Cotton-Topperalong side the "Little Guy" again. The clear cellophane door is a possible indicator that it is post war, but that's not entirely reliable, as cellophane doors do appear in late '30's pieces. The more intricate printing pattern is probably indicative of late prewar. I have seen at least one LOGGIE with a base 11 3/4" X 9 1/2" that would fully cover a standard sheet of typing paper and more. (The prewar GIANT class.) But it was exactly the same style and had no more detail than the medium size version. Just having a corrugated cardboard roof does constitute a true "Loggie." The sides must be corrugated. The roof may or may not be.